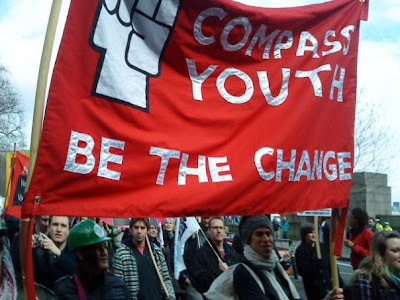 Compass Youth members have been taking part in the UK Uncut campaign against corporate tax avoidance, with several joining the demonstrations highlighting the vast sums of money being avoided by some of Britain’s biggest companies or their owners, amongst them Phillip Green’s Arcadia Group and Vodaphone. Whilst little action is taken against these multi-million pound tax avoiders, the government is slashing public services and targeting fraud at the bottom end of society. Today I have returned some items of clothing I bought from your Topman Oxford Street store a few weeks ago, and have kindly been refunded under the returns policy by your helpful staff. I’m writing to you to let you know why this was necessary and why I feel I must cease to be a customer of your clothing stores. Yesterday I heard about the sit-in protests, coordinated by ‘UK Uncut’, at shops on Oxford Street belonging to your Arcadia Group. These protests sought to raise awareness of the measures you take to avoid paying tax on the income from your UK business ventures, including the use of your family in the tax haven of Monaco: arrangements which in 2005 alone deprived the UK exchequer of at least £285 million (as reported by the BBC’s Money Programme). This figure is easily enough to save hundreds of libraries earmarked for closure by local councils, or pay the salaries of 10,000 police officers. You have previously argued that your profitable companies have already paid hundreds of millions of tax in the UK. I agree that your success as an entrepreneur deserves praise and respect, and that you have not broken the letter of the law in your efforts to avoid tax. At the same time, I know that you can appreciate that the success of UK companies depends not only on individuals but on the support of well-funded public services which treat the sick, educate the workforce, keep the peace and help transport goods and staff to work. I work as a front line manager in the public sector, and am pleased to report to you, as you are the UK government’s efficiency adviser, that my team and the 130 staff we manage have succeeded in saving at least £120,000 of taxpayer’s money so far this financial year (a saving of around 45% from our budget for non-staff costs and overtime). While I support the changes we have made locally, these savings have not been without pain. I’d at least like to be able to say to my staff that the country’s citizens are all in this together, rich and poor. In an era of financial austerity with huge cuts being made to public spending, it does not seem right that while most of the working population pays 20-40% income tax, you and numerous other wealthy individuals are able to avoid your fair share as defined by democratically elected governments. I’ve taken a small action today to make a point. But perhaps in light of the pressures on the country’s finances, and while you continue to benefit from its consumers, you could join your fellow citizens in conforming to the spirit of the UK’s tax laws by making a fair contribution to the public services on which our economy and society depend.